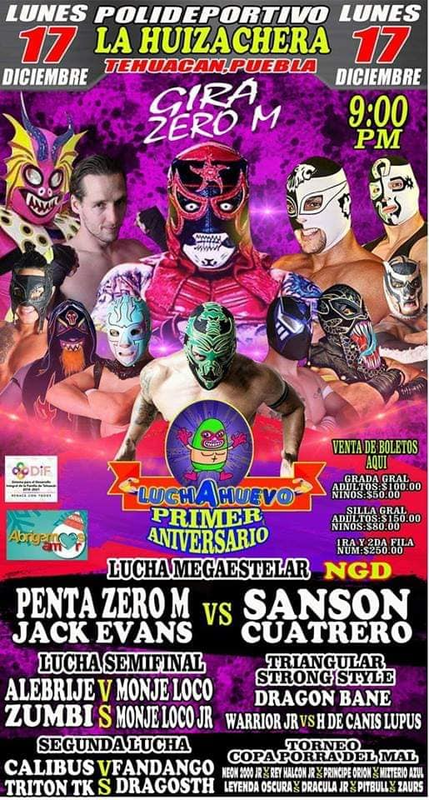 4) Alebrije & Zumbi vs Monje Loco & Monje Loco Jr.
3) Hijo Del Vikingo & Lady Shany vs Hades & Villano III Jr.
Debuts of all four. Latigo beat Astrolux via powerbomb in a very good match. 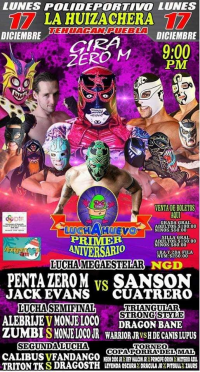 Main show debut for Halcon 78 Jr. (who appeared in a dark match in Queretaro last year.) Vikingo pinned 78 with a 450. Killer Kross destroyed all 4 afterwards. Faby beat Ashley (who is/was to get a title shot in Arena Aficion.) Faby attacked Hades after the match, with the tecnicas making the save. 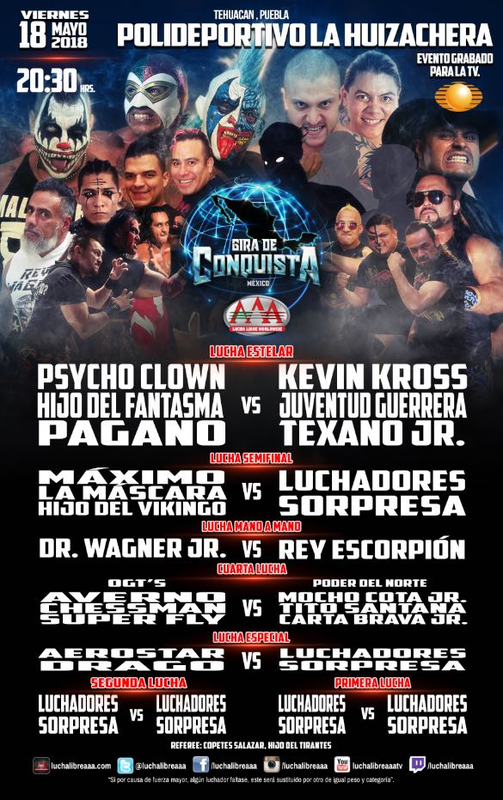 Mascara submitted Psicosis to a campana. Histeria wrestled without his mask. Prior to match, a vignette with these two teams (& Poder del Norte) had the tecnicos angry and declaring the rudos couldn't beat them without pulling a mask. They couldn't on this show: Escorpion unmasked Aerostar for the DQ. Samoano was now with Escorpion & Texano and interfering thru the match. Fantasma & Clown briefly had problems during in the match. Kross betrayed Hernandez, who definitely is not in MAD, then Juventued Guerrera appeared to trick Fantasma into hitting Psycho Clown. The two men in the TripleMania main event brawled, then were beaten up by MAD. A MAD masked man - obviously Konnan - watched from the entrance area. Surpise title match. 3rd defense, Wagner winning clean with the Wagner Driver. Lady Shani seconded Pagano for no obvious reason outside of being available for Faby Apache to attack post match. 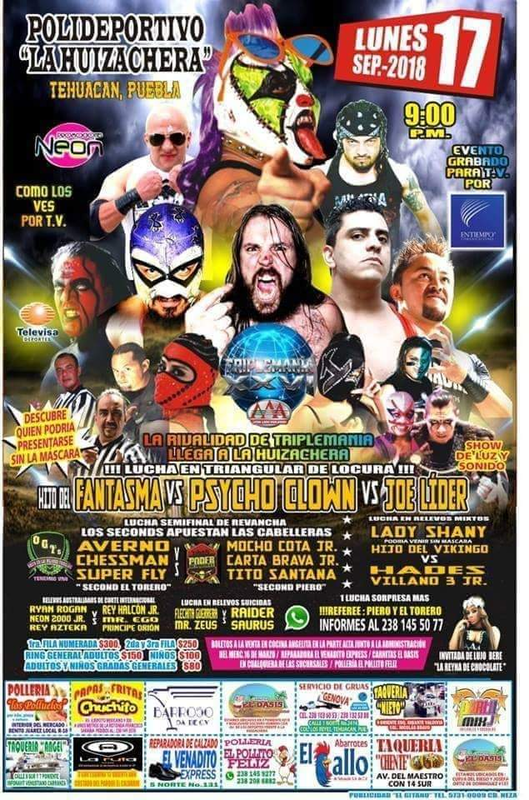 Murder Clown also attacked Pagano before their match in Arena Aficion.